New books by Sangharakshita now available! 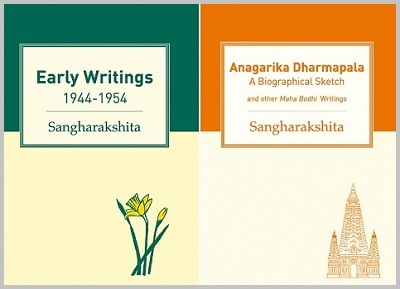 Sangharakshita’s Early Writings: 1944-1954 and his Anagarika Dharmapala: A Biographical Sketch and Other Maha Bodhi Writings are now available to purchase from our website, both in print book and eBook format. Early Writings is a collection of pieces crucial to the development of Sangharakshita’s thought and expression, and in Anagarika Dharmapala Sangharakshita tells the life of one of the leading figures in the modern Buddhist world with vividness and passion. Remember to join us in wishing Sangharakshita a very happy 89th birthday next Tuesday, and donate to our Living with Kindness and Living Ethically fundraising campaign to be in with a chance of winning a copy of A Survey of Buddhism signed by the man himself!